Sweet Grace Farm Nigerian Dwarf Goats in Central Pa.
Our kids usually start arriving in March and are dam-raised for about 8 weeks at which time they are ready to leave the farm. Our breeding line up will be posted in the fall and we will take reservations on spring kiddings. 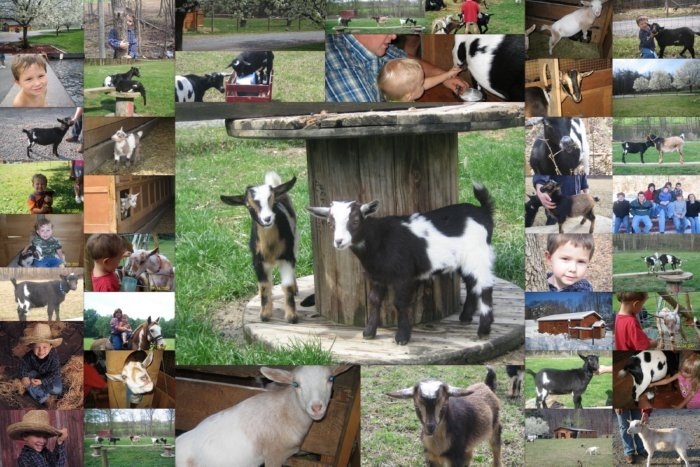 We have been thoroughly enjoying our adventure with these smallest of dairy goats for about 4 years now. 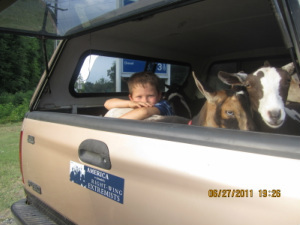 We purchased our first 3 does and buck from Cornerstone Farm in Red Oak Va. Since that time we have grown our herd with some of our own breeding, and this summer we acquired some does and bucks from DoubleTree Farm, Apache Downs, and Jaw Dropping Farm. These past two years we have ventured into the world of goat shows and have been pleasantly surprised at how well some of our girls have done. We are striving to improve our breeding program to produce goats who have great confirmations and milk production. Please visit our buck and doe pages to see our foundation animals. There you will find information on their blood lines, show wins and scoring. Thanks for visiting and we hope that you have found your visit here both fun and informative. Please do not hesitate to contact us with any questions that you may have.